WHEN WILLIAM CLARK of Freeport, Illinois, and his party participated in the westward movement that carried thousands of American to the Pacific Coast during the mid-nineteenth century, they demonstrated remarkable fidelity to a Christian institution. Leaving Leavenworth in 1857, Clark and three others joined up with a firm that was to haul freight to army posts in Utah. The four man contracted “with the express understanding that we should not be asked to drive Sundays, unless for the want of grass or water.” The men pledged to each other to stand by their bargain. After another such encounter, Rennick discharged the four and refused to let them take their guns. A tense confrontation with guns drawn followed. Clark and his companions feared for their lives. Rennick had “men enough to massacre us,” Clark retaliated, “but not enough . . . to make us drive a single rod.” Rennick pleaded with the men, who remained adamant. Never again were they asked to drive on the Sabbath. This encounter might have been exceptional, but it illustrates that Sabbath observance was still important when Americans set out on the Overland Trail for the Pacific Coast. “He who starts across the continent,” wrote one overland diarist in 1852, “is most sure to leave his religion on the east side of the Missouri river.” This notion entered the history books. 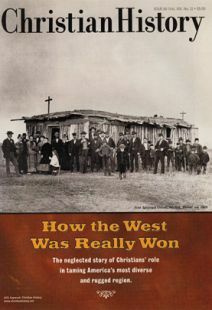 But first-hand accounts of the westward movement reveal a more complex reality. Crossing the plains, the desert, and the mountains was a serious undertaking, and in 1849 and 1850 most emigrants traveled in organized wagon trains for mutual assistance and protection. Before jumping off, some companies drafted a constitution stipulating that the Sabbath was to be a day of rest except in cases of absolute necessity. The reasons for Sabbath observance were practical as well as religious. “Never travel on the Sabbath,” advised Joseph E. Ware in The Emigrant’s Guide to California (1849). “Those who lay by on the Sabbath, resting themselves and their teams,” Ware added, “would get to California 20 days sooner that those who traveled seven days a week. Sabbath observance was generally best during the early weeks on the trail, but even people reared under religious influences often lost their moral bearings once they entered a land where neither law nor common practice restrained. The issue caused dissension and split otherwise harmonious parties. In addition, the passion for speed fed on itself, fracturing companies into even smaller units that treated all days alike. Necessity ruled with an iron hand. Trains depended on campsites with water, grass, and wood. Each train competed with hundreds of others for these essentials. Some companies set out intending to observe the holy day but found it hard to do so. Ansel J. McCall of Bath, New York, who joined the Robidoux company west of St. Joseph’s, proposed that the company rest on the Sabbath except in case of necessity. His motion failed, and at Salt Lake the assembly fell apart. McCall’s group remained in camp on 11 of 17 Sabbaths on the trail. Elisha D. Perkins, an Ohio journalist, left for California with the Marietta Gold Hunters. Members agreed to rest on the Sabbath, “an arrangement the policy of which is evident to those who know anything of frontier travelling, & very gratifying to those who have been taught to reverence the day at home.” The company planned its Saturday travel with a view to camping on the Sabbath for the rest that the day afforded man and beast. In time, however, necessity obliged the ensemble to travel on the Sabbath. Members split into smaller groups so as to travel faster. A third pattern of Sabbath observance was that of emigrant groups with a strong commitment to the Fourth Commandment. These companies generally set out by observing the Sabbath according to a written rule or a tacit agreement but found it difficult to realize their ideal. They divided over Sunday travel. Charles E. Pancoast, a Quaker druggist from St. Louis, went to California with a company of 200 that passed a resolution not to travel on the Sunday when it could be avoided. They lay over every Sabbath except two, when, because of necessity, they moved. Augustus R. Burbank of Naples, Illinois, and his wife were staunch Sabbatarians. Their group was organized “expressly was a Sabbath observing company & all joined as such with this understanding.” Soon, however, some members favored moving on the Sabbath. “There is but few men that will keep the Sabba“ Burbank “where there is sacrifice to be made.” Burbank’s party, which split from the rest of the company over the issue of Sunday travel, achieved a nearly perfect record of Sabbath-keeping en route to Sacramento. Ideally, the Sabbath was a day of rest for both humans and animals. When Joseph Warren Wood of Walworth, Wisconsin, and his company of 60 men rested one Sunday, a blast of the horn summoned members to hear a sermon by an old preacher. For some Argonauts a minister pro tem stood in the center of a corral, conducting a devotional service while everyone continued with his or her work. The rest day was not typically one of leisure. Routine chores that were regarded as unchristian at home—making repairs, rearranging loads, cooking, and washing clothes—had to be done. These accounts of Sabbath observance on the Overland Trail illuminate important aspects of American religious development. The trek westward was a mirror reflecting the character of the emigrants and the quality of the society from which they came. Almost certainly men and women who participated in this movement viewed the Sabbath in a new light when they reached the Pacific Coast. Winton U. Solberg is professor emeritus of history, University of Illinois, Urbana-Champaign. The most controversial, and most effective, missionary to the West and Alaska, Sheldon Jackson was always pushing the boundaries.